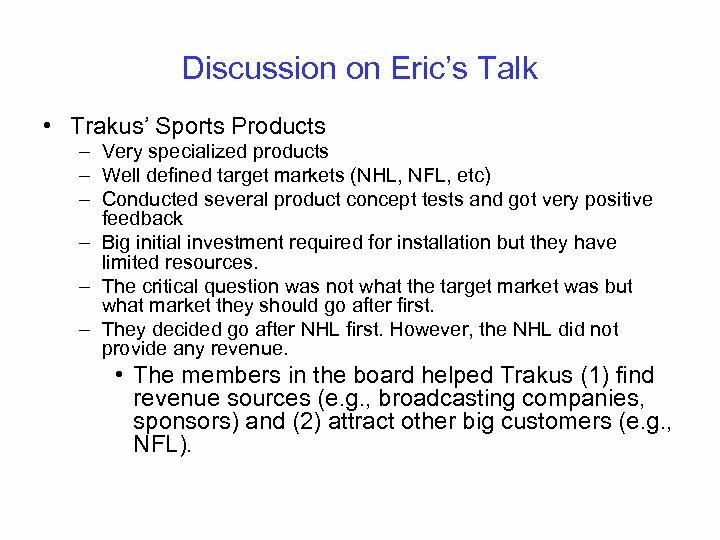 Discussion on Eric’s Talk • Trakus’ Sports Products – Very specialized products – Well defined target markets (NHL, NFL, etc) – Conducted several product concept tests and got very positive feedback – Big initial investment required for installation but they have limited resources. 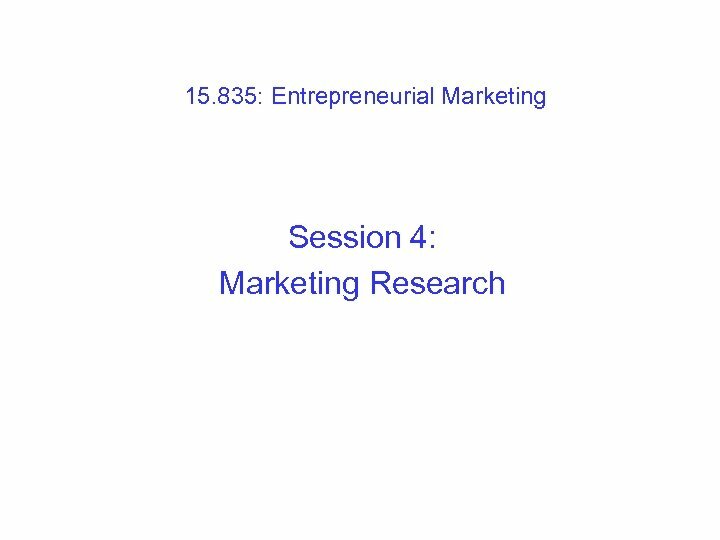 – The critical question was not what the target market was but what market they should go after first. – They decided go after NHL first. However, the NHL did not provide any revenue. • The members in the board helped Trakus (1) find revenue sources (e. g. , broadcasting companies, sponsors) and (2) attract other big customers (e. g. , NFL). 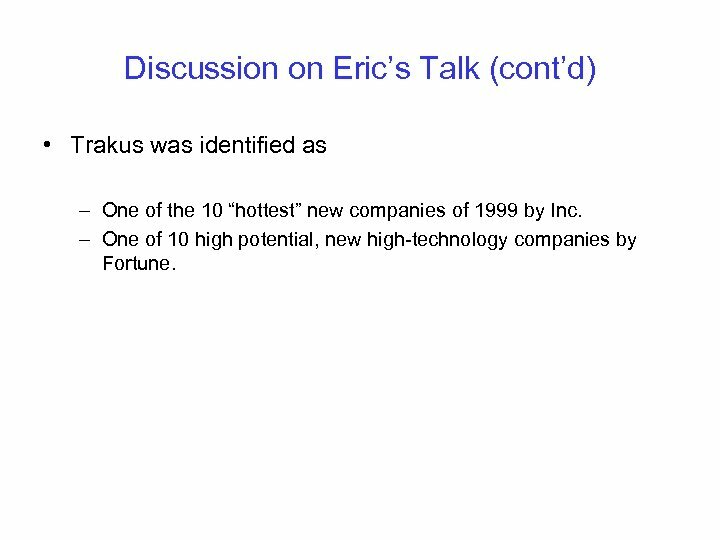 Discussion on Eric’s Talk (cont’d) • Trakus was identified as – One of the 10 “hottest” new companies of 1999 by Inc. – One of 10 high potential, new high-technology companies by Fortune. 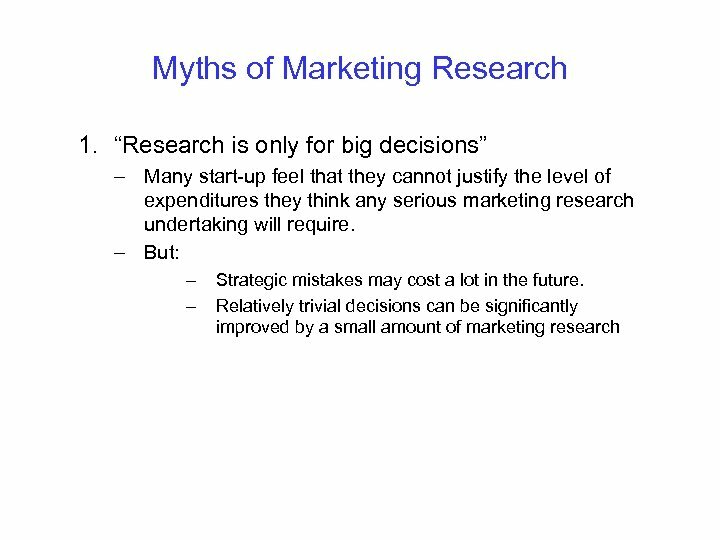 Need for Marketing Research • Entrepreneurs do not have sufficient information when they start their businesses. • They need to be able to update plans over time. 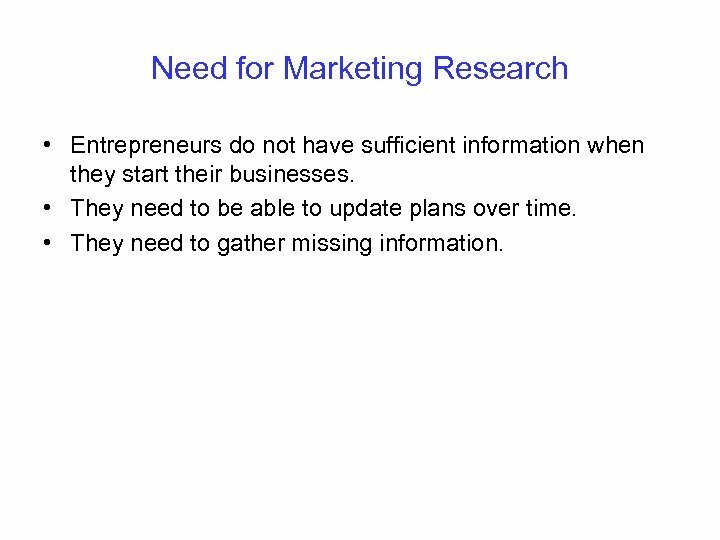 • They need to gather missing information. 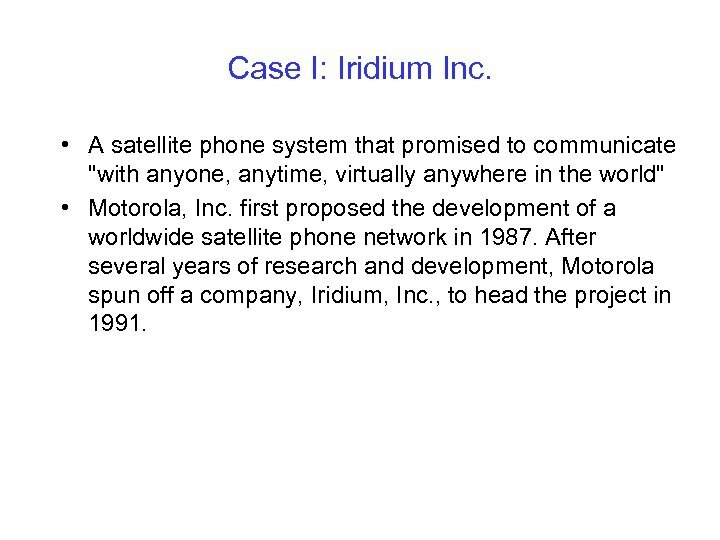 Case I: Iridium Inc. • A satellite phone system that promised to communicate "with anyone, anytime, virtually anywhere in the world" • Motorola, Inc. first proposed the development of a worldwide satellite phone network in 1987. After several years of research and development, Motorola spun off a company, Iridium, Inc. , to head the project in 1991. 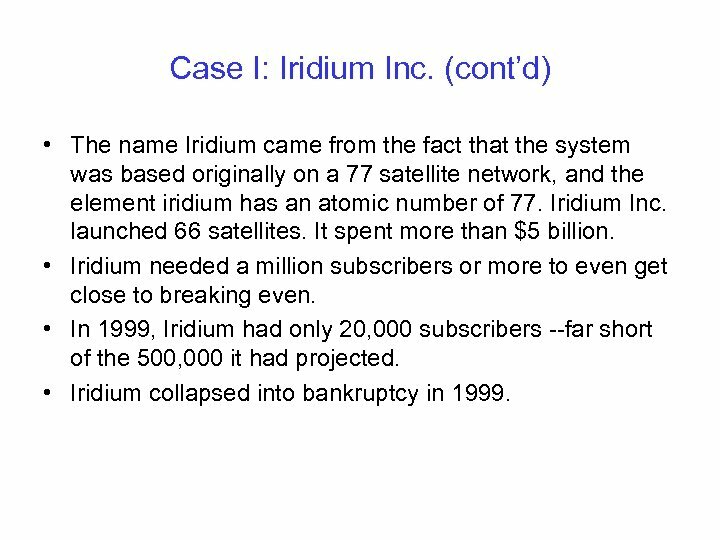 Case I: Iridium Inc. (cont’d) • The name Iridium came from the fact that the system was based originally on a 77 satellite network, and the element iridium has an atomic number of 77. Iridium Inc. launched 66 satellites. It spent more than $5 billion. • Iridium needed a million subscribers or more to even get close to breaking even. • In 1999, Iridium had only 20, 000 subscribers --far short of the 500, 000 it had projected. • Iridium collapsed into bankruptcy in 1999. 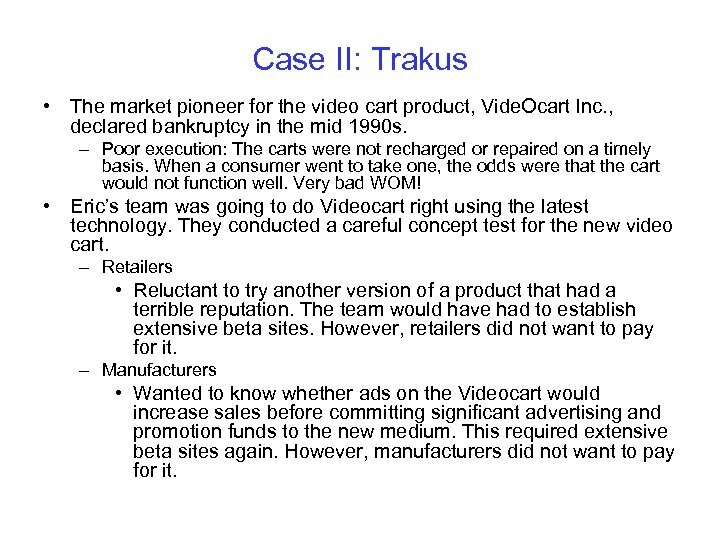 Case II: Trakus • The market pioneer for the video cart product, Vide. Ocart Inc. , declared bankruptcy in the mid 1990 s. – Poor execution: The carts were not recharged or repaired on a timely basis. When a consumer went to take one, the odds were that the cart would not function well. Very bad WOM! • Eric’s team was going to do Videocart right using the latest technology. They conducted a careful concept test for the new video cart. – Retailers • Reluctant to try another version of a product that had a terrible reputation. The team would have had to establish extensive beta sites. However, retailers did not want to pay for it. – Manufacturers • Wanted to know whether ads on the Videocart would increase sales before committing significant advertising and promotion funds to the new medium. This required extensive beta sites again. However, manufacturers did not want to pay for it. 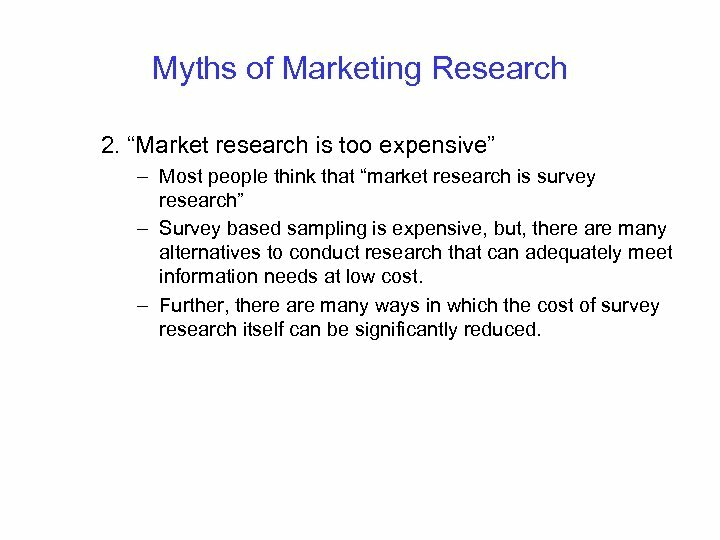 Myths of Marketing Research 2. 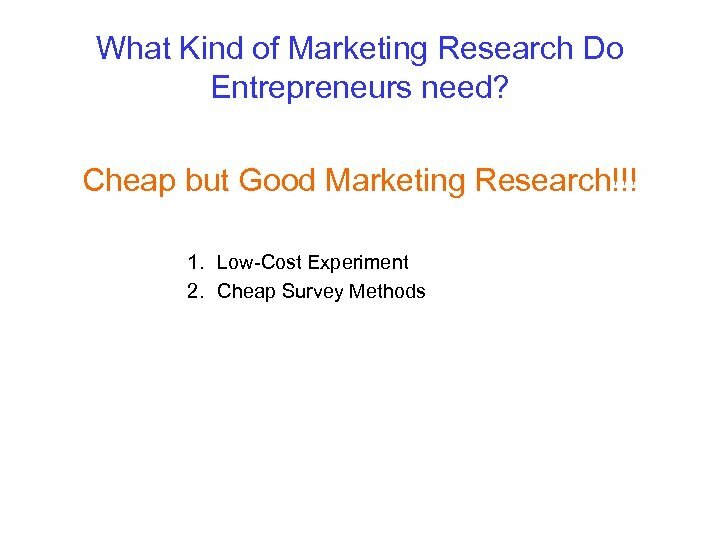 “Market research is too expensive” – Most people think that “market research is survey research” – Survey based sampling is expensive, but, there are many alternatives to conduct research that can adequately meet information needs at low cost. 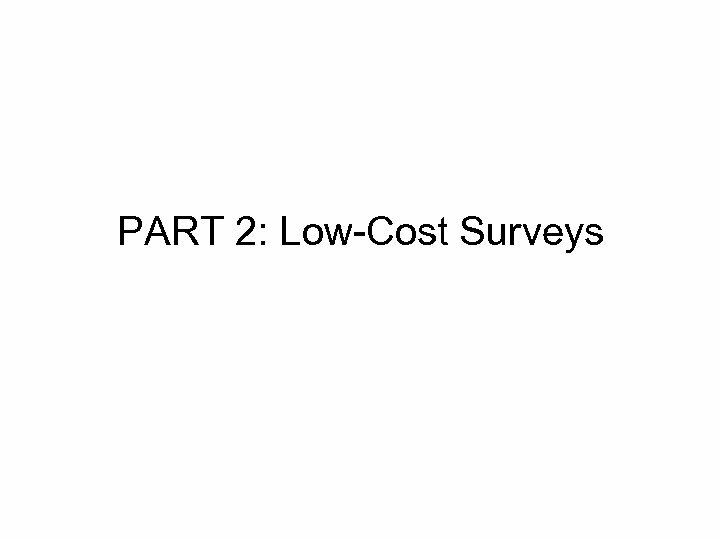 – Further, there are many ways in which the cost of survey research itself can be significantly reduced. 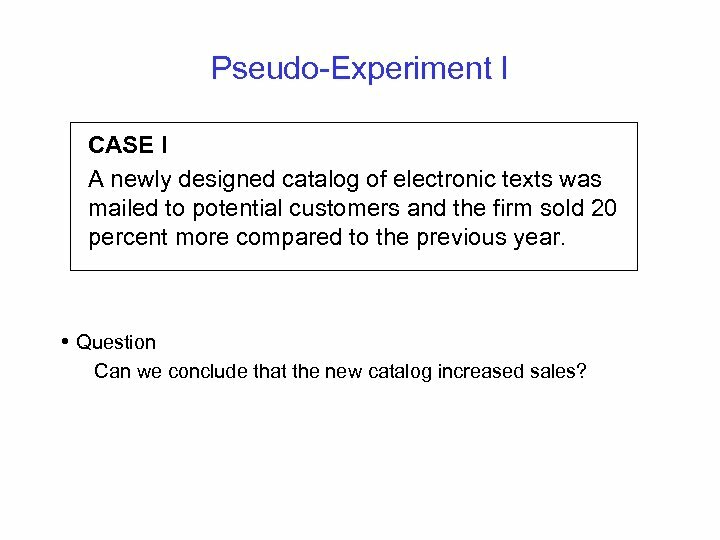 Pseudo-Experiment I CASE I A newly designed catalog of electronic texts was mailed to potential customers and the firm sold 20 percent more compared to the previous year. • Question Can we conclude that the new catalog increased sales? 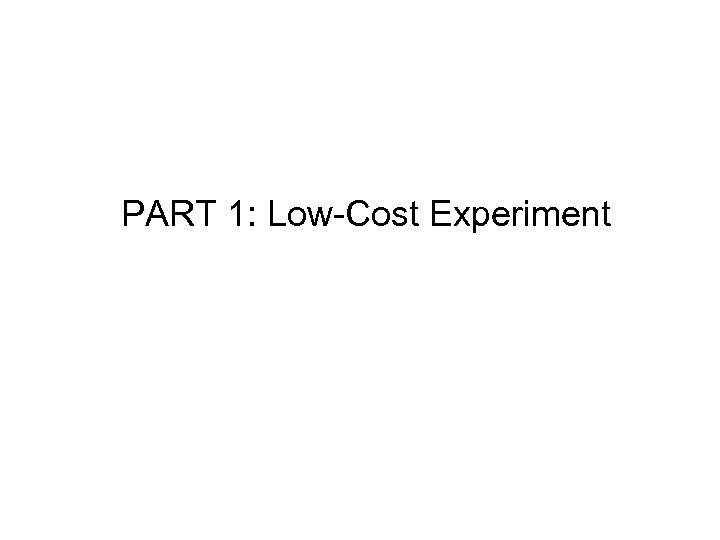 Pseudo-Experiment I (cont’d) • No. We cannot rule out other factors (e. g. improved economy) • What is the problem? – No control group – The mailing catalog was mailed to all potential buyers. • How to remedy the problem? 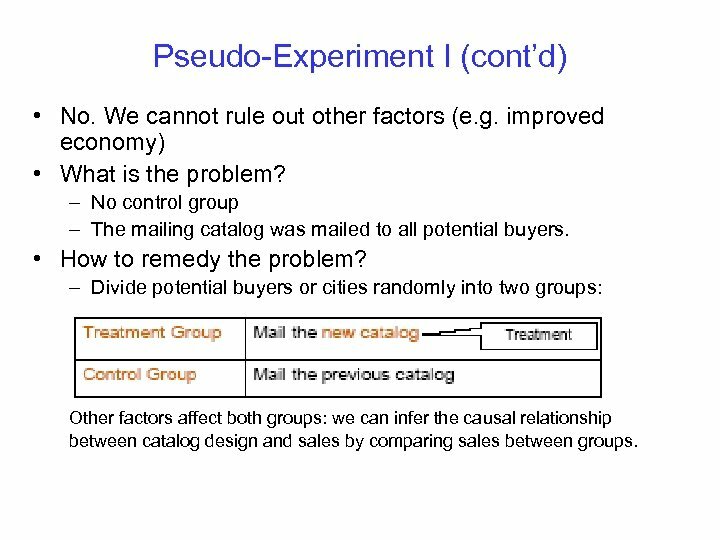 – Divide potential buyers or cities randomly into two groups: Other factors affect both groups: we can infer the causal relationship between catalog design and sales by comparing sales between groups. 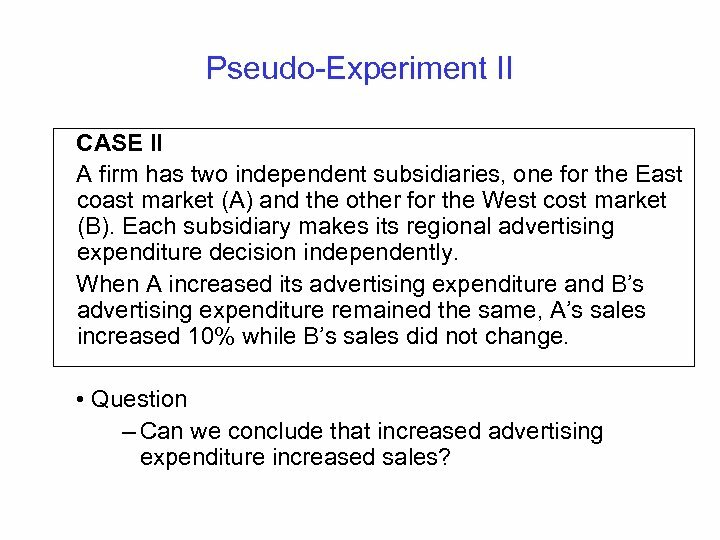 Pseudo-Experiment II CASE II A firm has two independent subsidiaries, one for the East coast market (A) and the other for the West cost market (B). Each subsidiary makes its regional advertising expenditure decision independently. 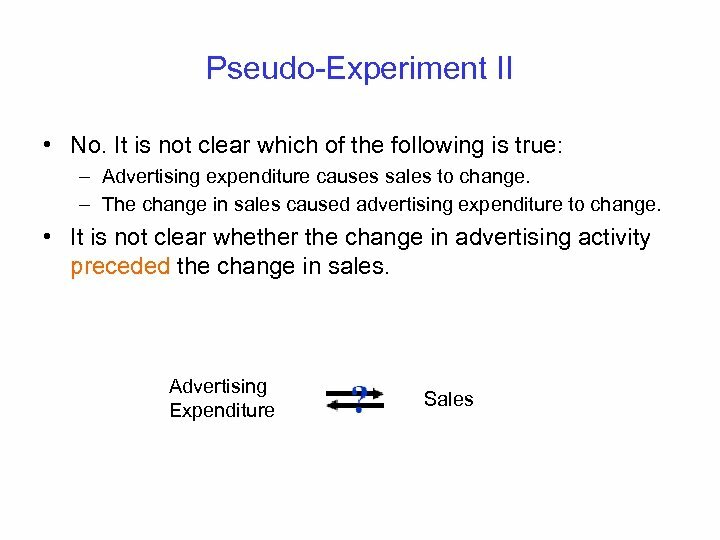 When A increased its advertising expenditure and B’s advertising expenditure remained the same, A’s sales increased 10% while B’s sales did not change. • Question – Can we conclude that increased advertising expenditure increased sales? 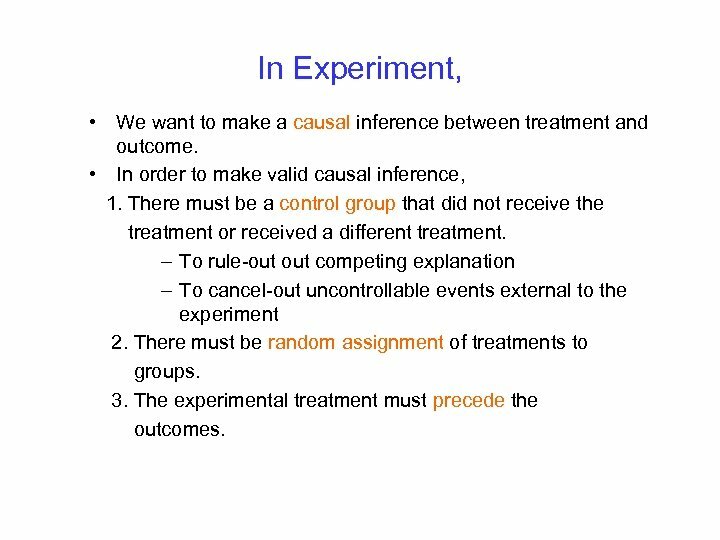 In Experiment, • We want to make a causal inference between treatment and outcome. 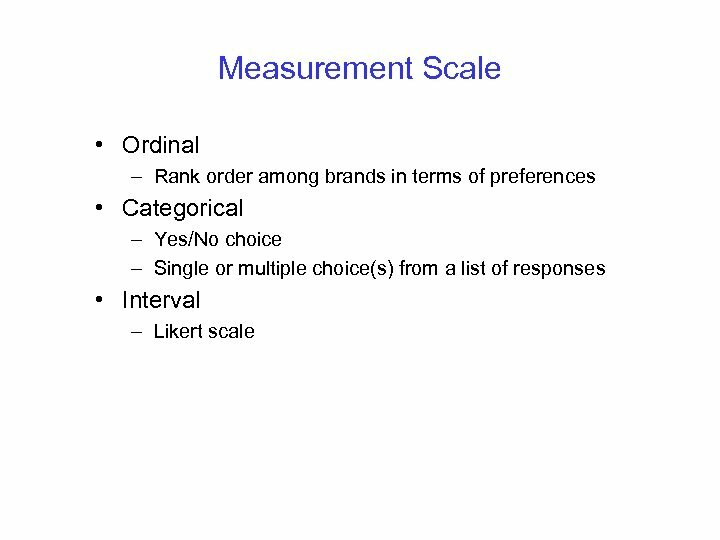 • In order to make valid causal inference, 1. There must be a control group that did not receive the treatment or received a different treatment. – To rule-out competing explanation – To cancel-out uncontrollable events external to the experiment 2. 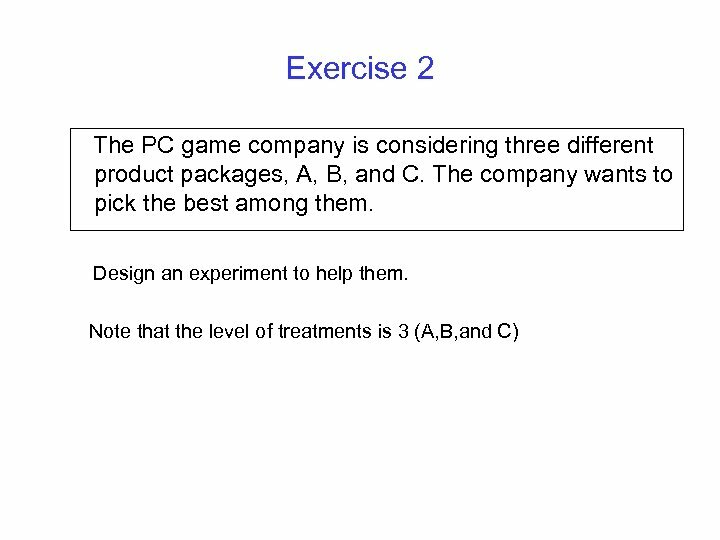 There must be random assignment of treatments to groups. 3. 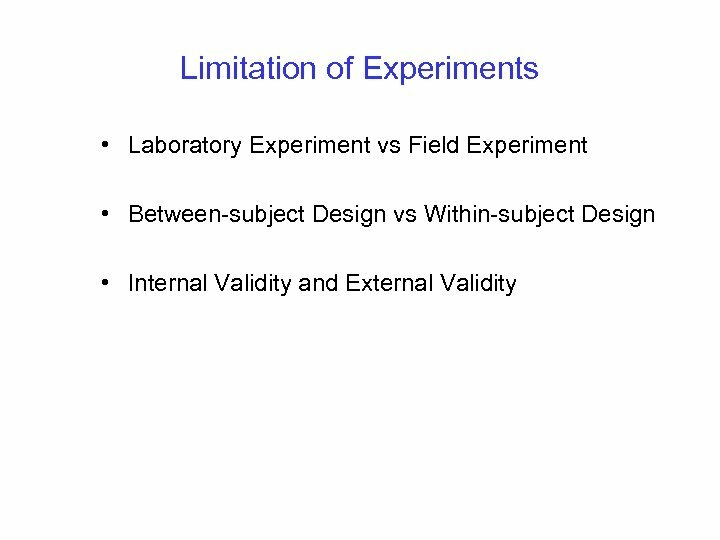 The experimental treatment must precede the outcomes. 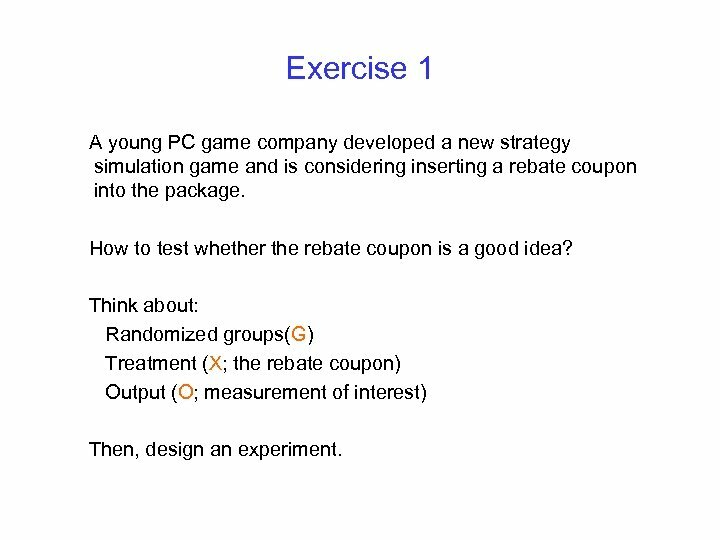 Exercise 1 A young PC game company developed a new strategy simulation game and is considering inserting a rebate coupon into the package. How to test whether the rebate coupon is a good idea? 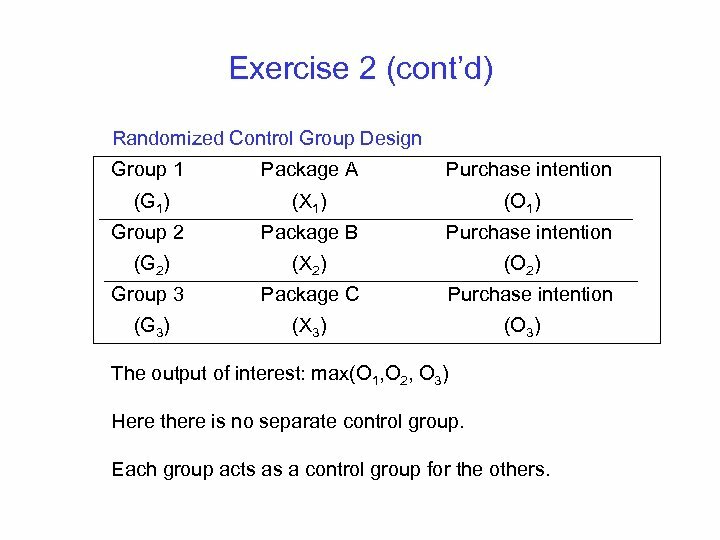 Think about: Randomized groups(G) Treatment (X; the rebate coupon) Output (O; measurement of interest) Then, design an experiment. 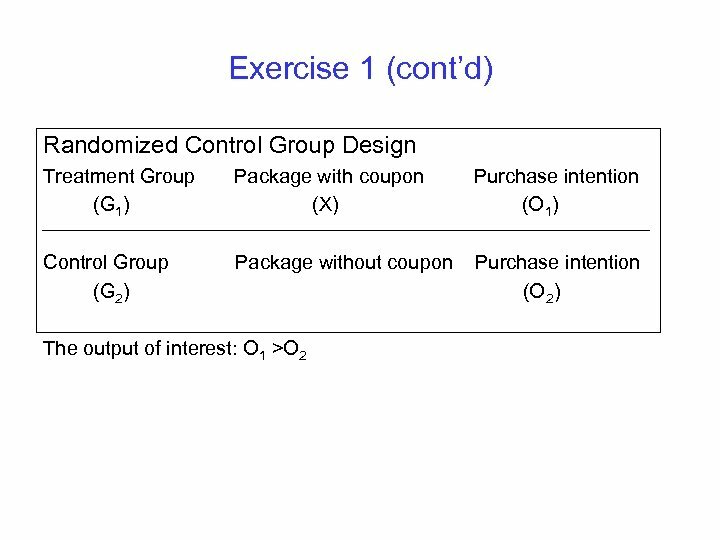 Exercise 2 (cont’d) Randomized Control Group Design Group 1 Package A (G 1) (X 1) Group 2 Package B (G 2) (X 2) Group 3 Package C (G 3) Purchase intention (X 3) (O 1) Purchase intention (O 2) Purchase intention (O 3) The output of interest: max(O 1, O 2, O 3) Here there is no separate control group. Each group acts as a control group for the others. 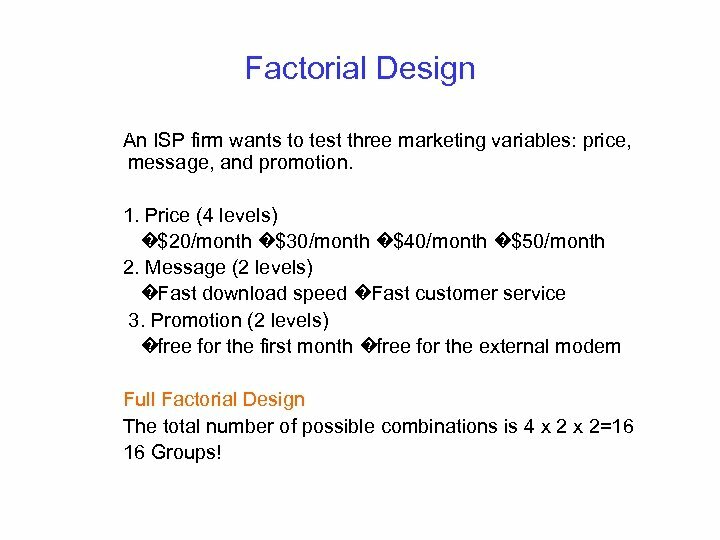 Factorial Design An ISP firm wants to test three marketing variables: price, message, and promotion. 1. Price (4 levels) �$20/month �$30/month �$40/month �$50/month 2. Message (2 levels) �Fast download speed �Fast customer service 3. Promotion (2 levels) �free for the first month �free for the external modem Full Factorial Design The total number of possible combinations is 4 x 2=16 16 Groups! 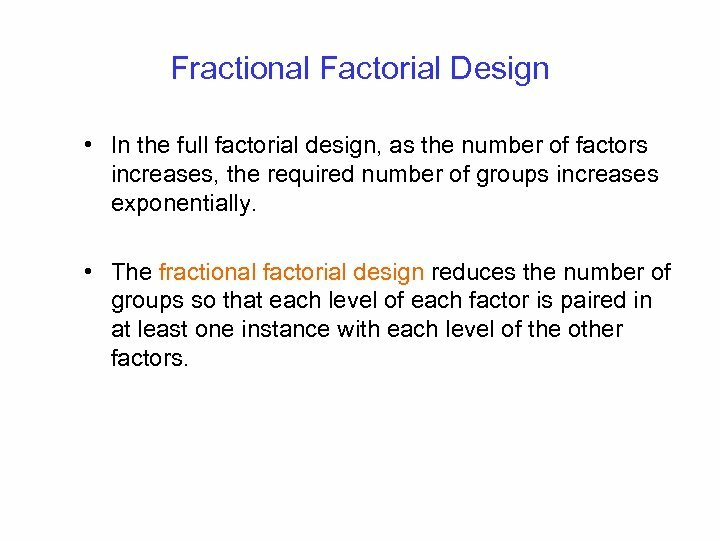 Fractional Factorial Design • In the full factorial design, as the number of factors increases, the required number of groups increases exponentially. 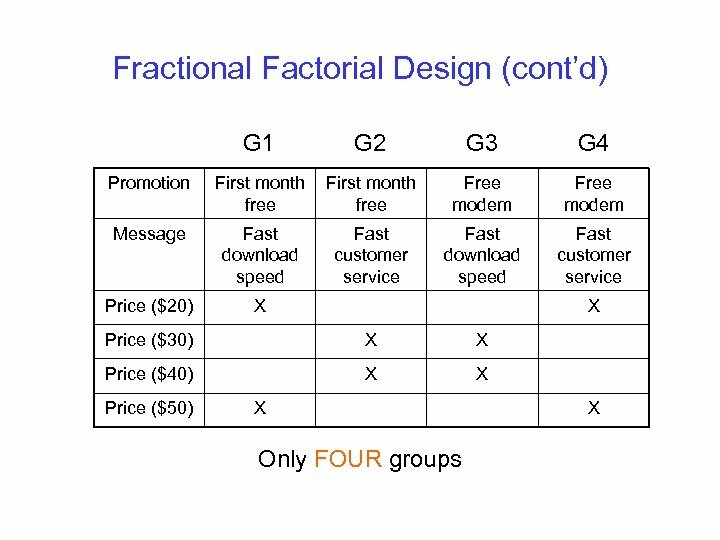 • The fractional factorial design reduces the number of groups so that each level of each factor is paired in at least one instance with each level of the other factors. Sample Size? • The size of each group does not need to be big. 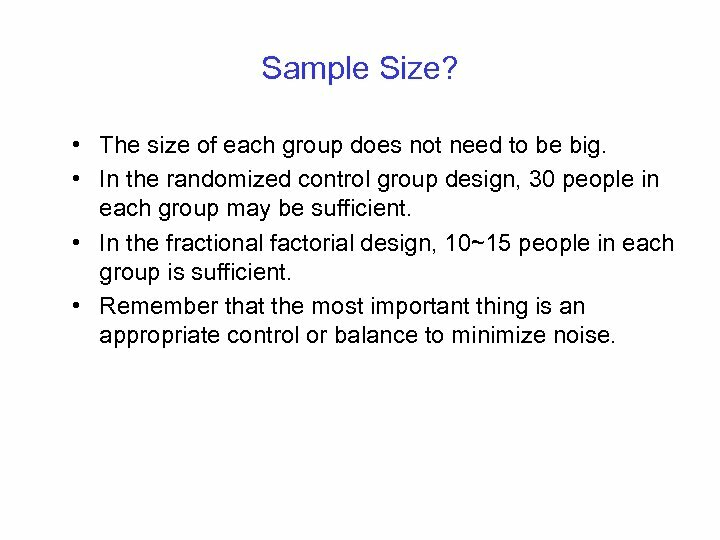 • In the randomized control group design, 30 people in each group may be sufficient. • In the fractional factorial design, 10~15 people in each group is sufficient. • Remember that the most important thing is an appropriate control or balance to minimize noise. 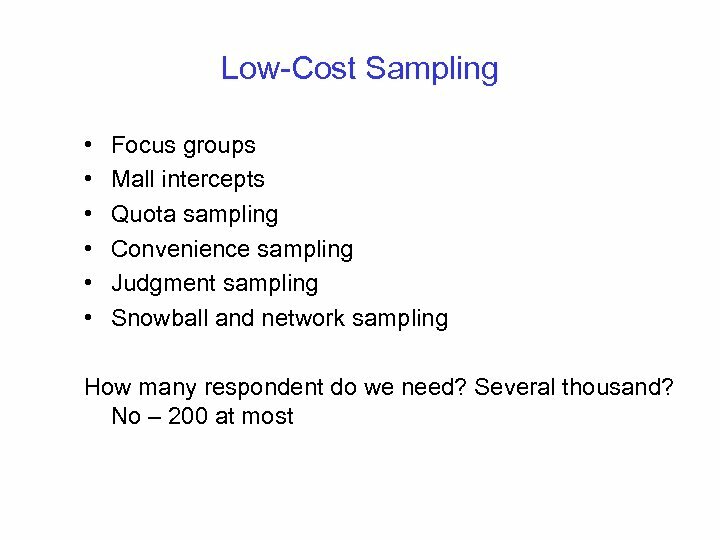 Low-Cost Survey Design • A survey with probabilistic sampling is expensive. 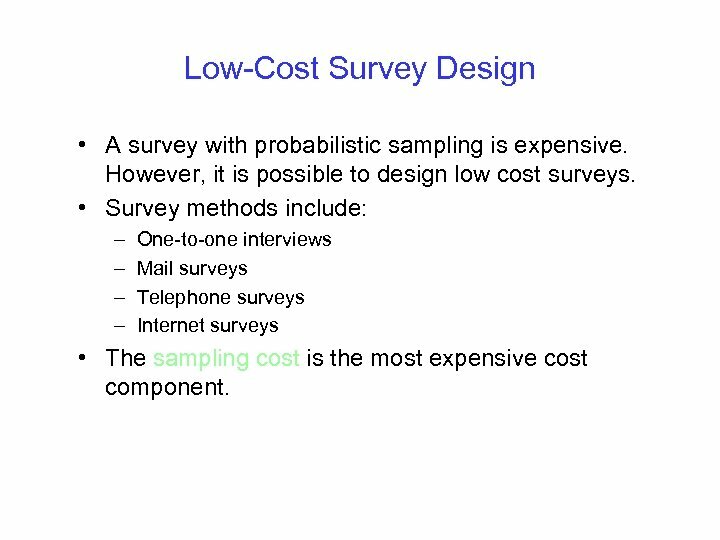 However, it is possible to design low cost surveys. 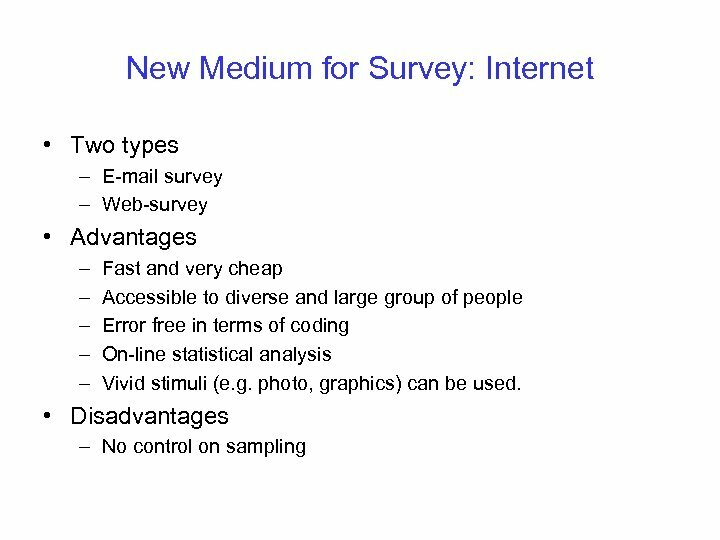 • Survey methods include: – – One-to-one interviews Mail surveys Telephone surveys Internet surveys • The sampling cost is the most expensive cost component. How Big Should Sample Size be? 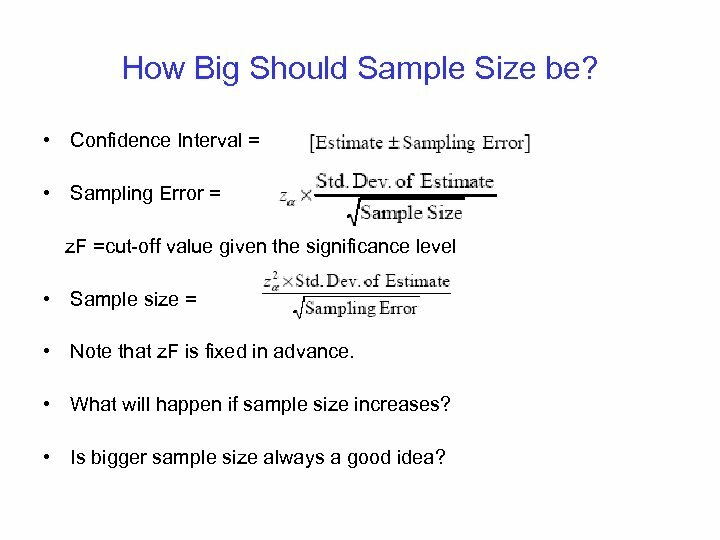 • Confidence Interval = • Sampling Error = z. F =cut-off value given the significance level • Sample size = • Note that z. F is fixed in advance. 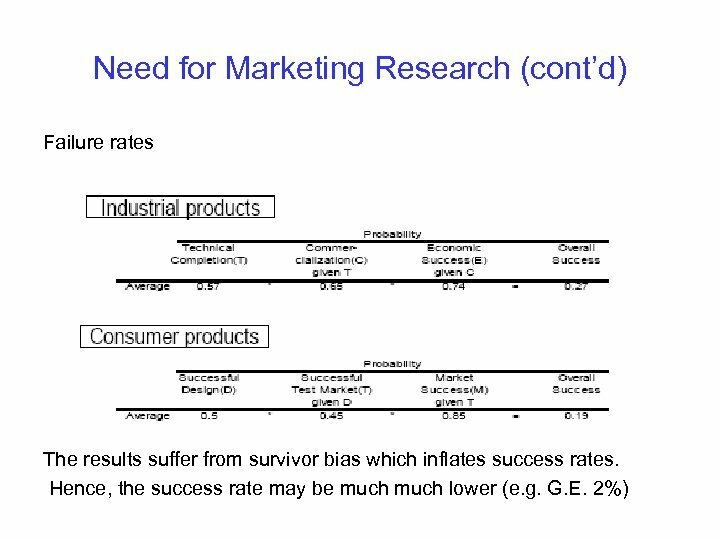 • What will happen if sample size increases? 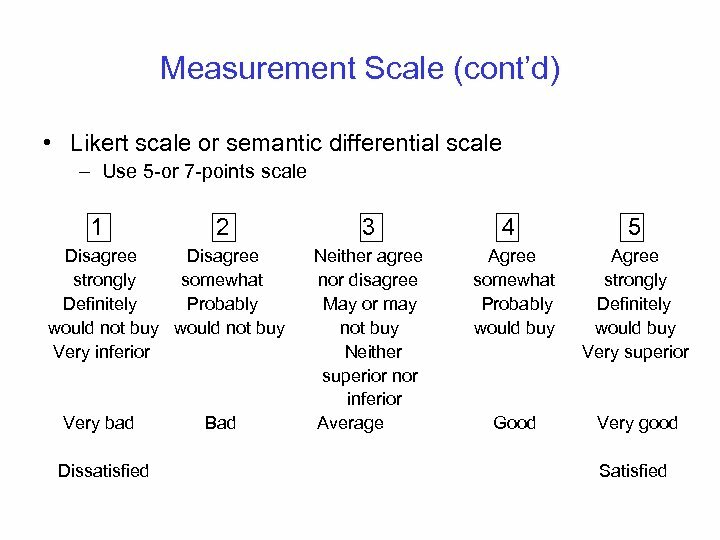 • Is bigger sample size always a good idea? 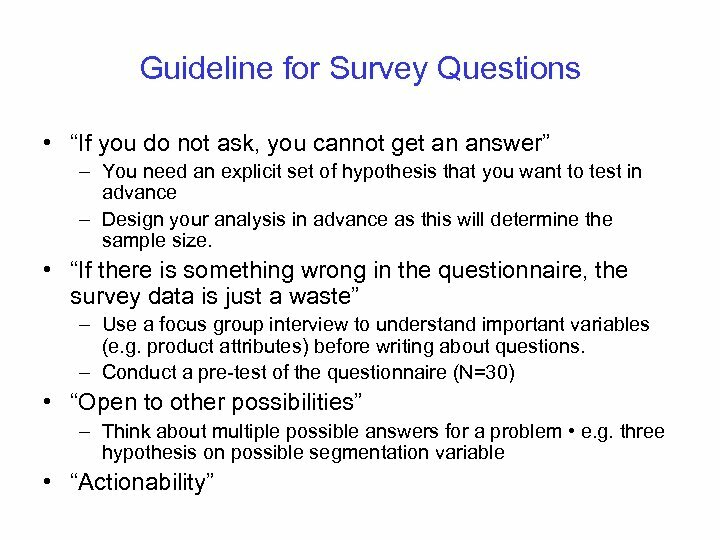 Guideline for Questions (cont’d) • Avoid questions that make respondents infer the answer you expect to get – e. g. Don’t you agree…? Wouldn’t you say…? • Minimize the number of open-ended questions. 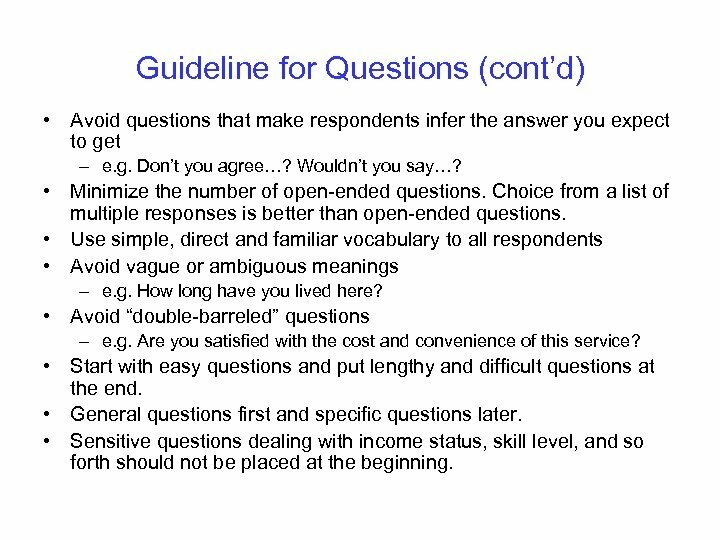 Choice from a list of multiple responses is better than open-ended questions. • Use simple, direct and familiar vocabulary to all respondents • Avoid vague or ambiguous meanings – e. g. How long have you lived here? • Avoid “double-barreled” questions – e. g. Are you satisfied with the cost and convenience of this service? • Start with easy questions and put lengthy and difficult questions at the end. • General questions first and specific questions later. • Sensitive questions dealing with income status, skill level, and so forth should not be placed at the beginning. 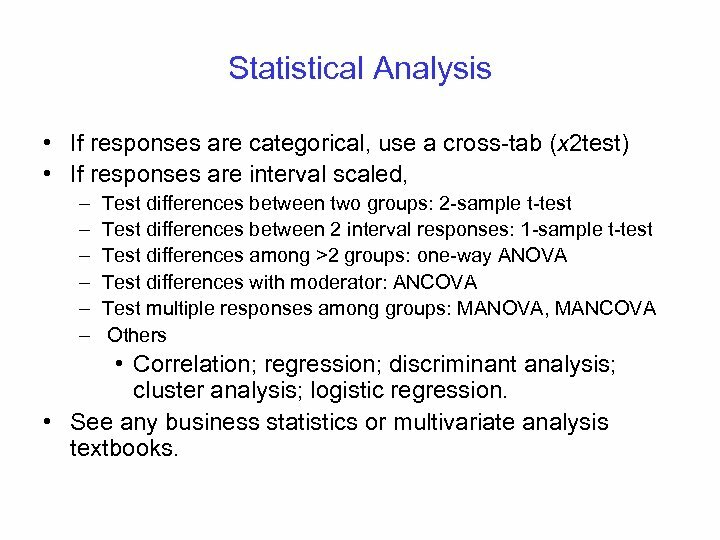 Statistical Analysis • If responses are categorical, use a cross-tab (x 2 test) • If responses are interval scaled, – – – Test differences between two groups: 2 -sample t-test Test differences between 2 interval responses: 1 -sample t-test Test differences among >2 groups: one-way ANOVA Test differences with moderator: ANCOVA Test multiple responses among groups: MANOVA, MANCOVA Others • Correlation; regression; discriminant analysis; cluster analysis; logistic regression. 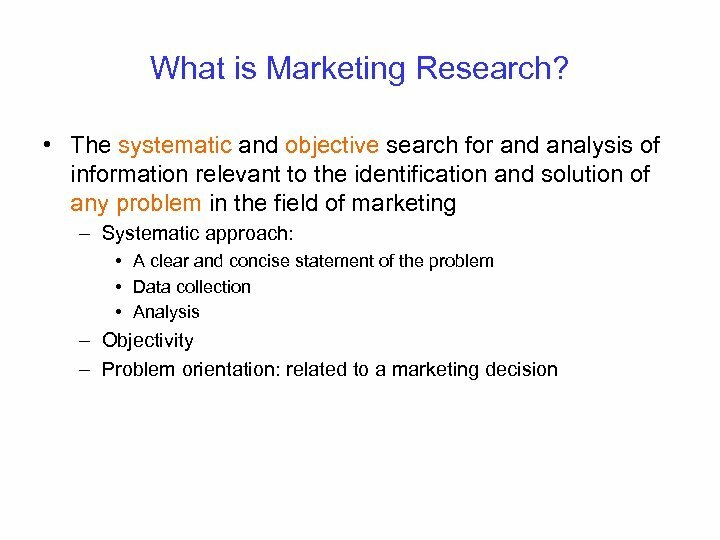 • See any business statistics or multivariate analysis textbooks.